A story revolving around the life of military men in the army. In the 1990's, drugs are proliferating in a country in the Southern region, creating a tense situation along the borders. Long Tan (Song Jialun) is the leader of a squad of investigators. Along with strategist Tang Kan (Ren Chengwei) and Xu Zeng, they receive orders to assist local law enforcement in taking down the drug syndicate. Their paths diverge when Tang Kan goes abroad for further studies, Long Tan is promoted and Xu Zeng ventures into business after being forced to retire from service. Yet no matter the place or the situation, they never forget the true spirit of a soldier. 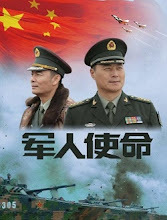 It is produced by Shandong Province San Guan Film and Television in collaboration with the Political Work Department of People‘s Republic of China Central Military Commission. Filming took place in Shandong and Yunnan. Miao Chan Shui who wrote the source novel also writes the screenplay. It was part of the movies selected for the 90th anniversary of the People's Liberation Army of China in 2017. Let us know why you like Jun Ren Shi Ming in the comments section. Please also share these fun facts using the social media buttons below.